2 pack Round NEOGEO Neo GEO NEO.GEO Gloss Gold Met. Vinyl Decal Sticker 4" x 4"
2 pack- NEOGEO Neo GEO NEO.GEO Gloss Gold Metallic Vinyl Decal Sticker 12" x 2"
2 pack Arcade Round NEOGEO Neo GEO Gloss Yellow/Blue Vinyl Decal Sticker 3"x 3"
4 pack -NEOGEO Neo GEO NEO.GEO Gloss White Vinyl Decal Sticker 3" wide x 1/2"
vinylty_decals has no other items for sale. 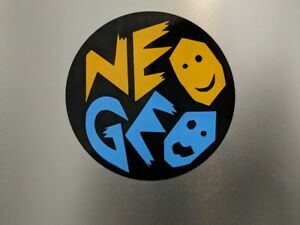 Details about 2 pack Arcade Round NEOGEO Neo GEO Gloss Yellow/Blue Vinyl Decal Sticker 4"x 4"